Brightly Green Concentrate is used with a ratio of 9 parts water to 1 part product. Save money & save the Earth! Directions: Spray on surface and wipe off with a cloth towel or paper towel until streak free. Where to use: Apply to coated wood surfaces. 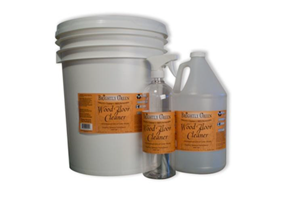 Brightly Green Wood Floor Cleaner is an all-natural wood floor cleaner and is effective on all coated wood floor surfaces. This product cuts through dirt, grime and grease with power from plant-based components. No harsh chemicals, vapors or residue. This product is 100% biodegradable and Earth-friendly. G4E is our unique blend of ingredients developed by HG Laboratories, LLC. All ingredients come from nature. Each formula is balanced to achieve optimum performance and superior cleaning without causing any damage to the environment and is non-toxic to people and pets. All products manufactured by HG Laboratories are cruelty free and made in America. Please recycle your bottle or better yet, buy one of our recycled bottles from our combo to reuse. Save money & save the Earth!